Set snugly in the oldest and most picturesque part of town, the studio looks out onto the renaissance façade of the Château Royale beyond. Recently refurbished, it offers comfortable accommodation for 2 in a very quiet location, yet is just a short stroll to the centre of Amboise with its excellent restaurants, cafés, shops and of course the château and the magnificent river Loire. The studio, which is self-contained and independent, has accommodation comprising a high ceilinged living room with dining and bedroom areas and a view onto the Château. A small kitchen area with sink, fridge, coffee machine, microwave & hotplate is ideal for preparing light meals & snacks. Each morning of your stay we will deliver a basket of fresh bread & croissants to your door between 8 & 9 am. The bed is a queen size (1m60) with luxury quality cotton linens provided and the bathroom has a shower, hand basin and toilet with fluffy white towels supplied. A narrow staircase leads up to a mezzanine area with armchairs, and books and magazines - an ideal spot for reading and relaxing or enjoying an aperitif after a long day of sightseeing. Wifi is available in the studio. 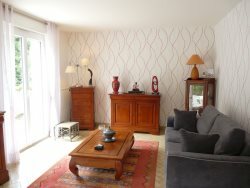 The studio is a perfect pied-à-terre for exploring the Loire Valley with all its architectural treasures, and yet has all the facilities of the attractive little town of Amboise on the door step.